Democrat Jocelyn Benson had a substantial fundraising advantage over her Republican opponent in the race to be Michigan’s top elections official. LANSING (March 11, 2019) — The 2018 campaign for secretary of state looked different than any other in recent Michigan history as a national group based in Washington D.C. spent nearly $1 million on the race. The state’s previous four secretary of state contests saw either little spending by groups acting outside of the candidates' campaigns or the outside spending was dominated by Michigan’s political parties. 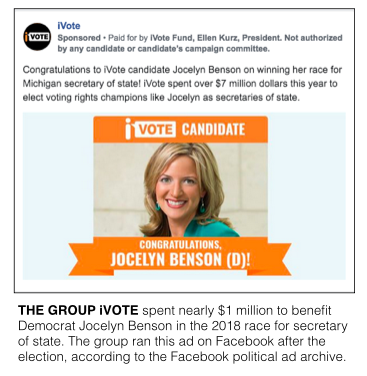 In 2018, however, a group called iVote reported spending $976,351 to support Democratic candidate Jocelyn Benson, the former dean of the Wayne State University Law School. The group’s spending represented about 26 percent of the money in the race. The group’s spending amounted to more than the Republican candidate, Mary Treder Lang of Grosse Pointe Farms, raised for her campaign: $770,064. Benson of Detroit raised $1.5 million for her campaign. Benson won the race with 52.9 percent of the vote. Treder Lang received 43.9 percent. According to its website, iVote “was created in 2014 with one goal: secure voting rights for all Americans.” The group says it works to elect Democratic secretaries of state and to pass automatic voter registration in states. The group didn't immediately respond to a request for comment. The secretary of state is the top elections official in Michigan. The national group got involved in the Michigan race through a super PAC called iVote Fund Michigan. It formed at the state level on Sept. 6, 2018, and dissolved after the election. In the meantime, it spent $876,350 with a media consulting firm in support of Benson or in opposition of Treder Lang. It also reported an additional $100,000 in-kind contribution from iVote Inc. The money went to online advertising benefiting Benson, according to campaign finance disclosures. “Why so much outside influence into the secretary of state election here in the state of Michigan?” Treder Lang asked during the debate. The group’s money primarily came from the iVote Fund, a 527 political organization that does file fundraising disclosures with the Internal Revenue Service (IRS). According to its repots with the IRS, the 527 raised $3.1 million over 2018. Its top donors were Stacy Schusterman of Oklahoma, CEO of Samson Energy, who gave $1 million and the progressive group American Bridge 21st Century, which gave $935,000. Schusterman also gave $500,000 to Michigan’s 2018 voting rights ballot proposal campaign and $500,000 to the ballot campaign for a nonpartisan redistricting commission. Other groups independently spending money to benefit Benson included the Democratic Association of Secretaries of State, which spent $80,628, Progress Michigan Political Action Fund, which spent $78,385, and Michigan Planned Parenthood Votes, which spent $13,526. The Michigan Republican Party was the main spender that worked to help Treder Lang. The Michigan GOP reported spending $125,923 in support of Treder Lang. 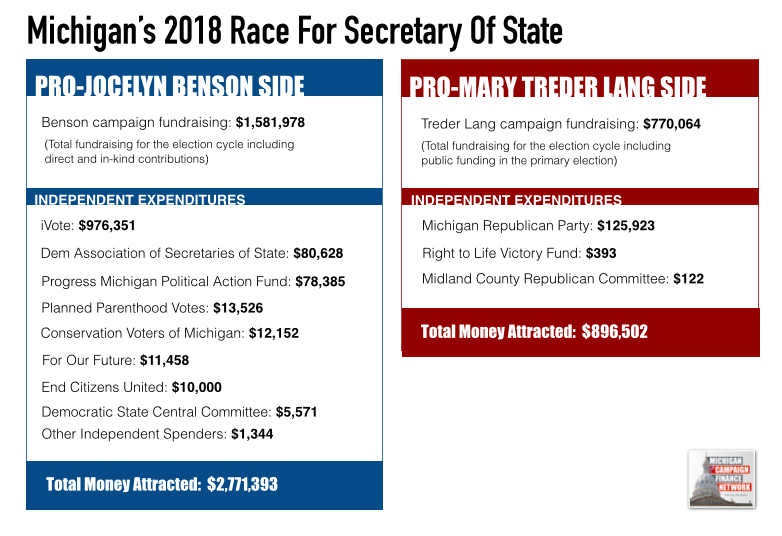 Overall, the race attracted about $3.6 million, making it the second most expensive secretary of state in Michigan history, according to the Michigan Campaign Finance Network’s tracking. The 2010 race between Benson and Republican Ruth Johnson attracted about $3.7 million, including $1.3 million in spending by the Michigan Republican Party and $465,000 in spending by the Michigan Democratic Party. Benson’s top direct donors for the 2018 election cycle were the United Auto Workers Michigan PAC ($68,000), the Michigan Regional Council of Carpenters ($68,000), the American Federation of State, County and Municipal Employees AFL-CIO ($68,000), the Michigan Education Association PAC ($30,000) and the Bernstein Family PAC and Bernstein family members ($23,600). Treder Lang’s top direct donors were the Michigan Republican Party ($131,522), members of the DeVos family ($40,800), members of the Barnes family, Belle Tire ($27,200), members of the Haworth family ($20,400) and the Auto Dealers of Michigan PAC ($15,000). For 2018, the most an individual could give a candidate for secretary of state was $6,800. A political action committee (PAC) could give $68,000. Political party committees and the candidates themselves could give more.